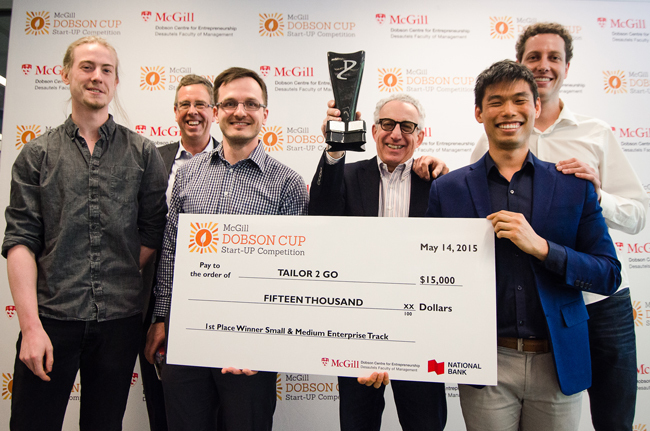 After three months of mentorship and start-up plan pitches, the McGill Dobson Centre for Entrepreneurship rewarded over $100,000 in cash and other prizes to the winners of the 2015 McGill Dobson Cup Start-UP Competition. This year, a record 237 teams applied to the competition. After three months of mentorship and start-up plan pitches, the McGill Dobson Centre for Entrepreneurship rewarded over $100,000 in cash and other prizes to the winners of the 2015 McGill Dobson Cup Start-UP Competition. This year, a record 237 teams applied to the competition, of which 193 teams, comprising 501 founders, vied for the chance to win one of three tracks: Social Enterprise; Small & Medium Enterprise; and Innovation Driven Enterprise. A growing competition across campus, the Cup saw a 52 per cent increase in applicants compared to 2014, with 60 per cent of the projects related to improving social conditions or the environment. Winning the Small & Medium Enterprise track was Tailor2Go, a company armed with a solar-powered truck and a 3D scanner that produces custom-fitted suits in three weeks. “The process has been very rewarding in a sense that it taught me to be more persistent and perseverant; it was very tough but made me think whether I am doing the right thing. I am very grateful about the whole experience,” said co-founder and McGill alumnus Nathan Kong. “Coming from non-management background, it was definitely a lot of learning as we went through the process,” said Saniter co-founder and Electrical Engineering student Swathi Sadagopan. “I am thankful for the help I got from my acquaintances and the mentorship, feedback, and resources provided by the Dobson Centre.” Sadagopan noted that the Indian Government has shown interest in the project and she is hoping to launch the pilot project this fall. McGill Dobson Cup judge Angelique Mannella, Treasurer of Global Campaign for Education-US and Mentor of the Founder Institute, is a great supporter of the competition. “The McGill Dobson Cup gives me a huge sense of optimism that McGill students and alumni are on a great path to change the world,” she said. The McGill Dobson Cup Start-UP Competition is open to students, alumni, faculty and staff of McGill University. Get more information about the competition. A new addition this year is the McGill X-1 Accelerator that is set to run for ten weeks this summer. Five promising teams from this year’s McGill Dobson Cup pool were selected to participate in this summer program. They will be taught to become better entrepreneurs through speaker events, workshops, and mentorship from professionals within the Montreal and McGill community. Great to see awesome entrepreneurial talent coming out of McGill!